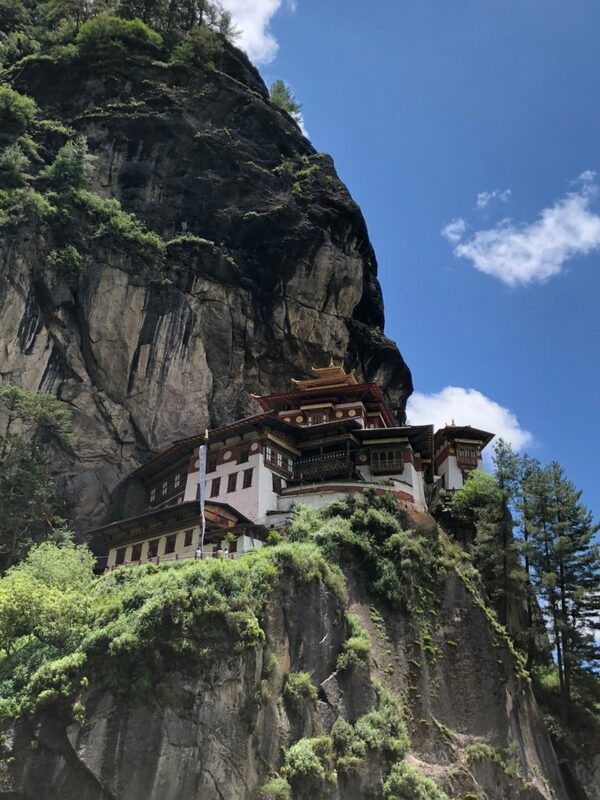 When I started planning my trip to Bhutan I did the usual online search of things to do and places to visit. 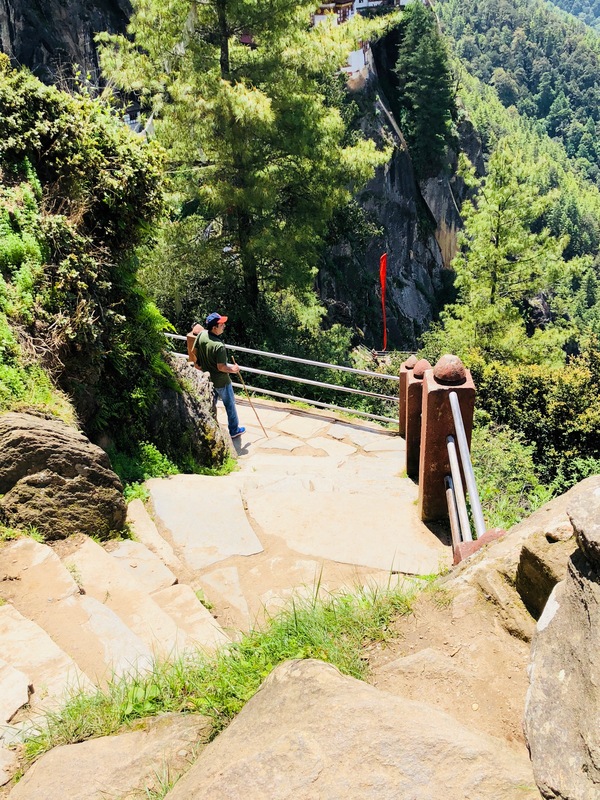 Almost everyone mentioned hiking up to Paro Taktsang – or the Tiger’s Nest Monastery. 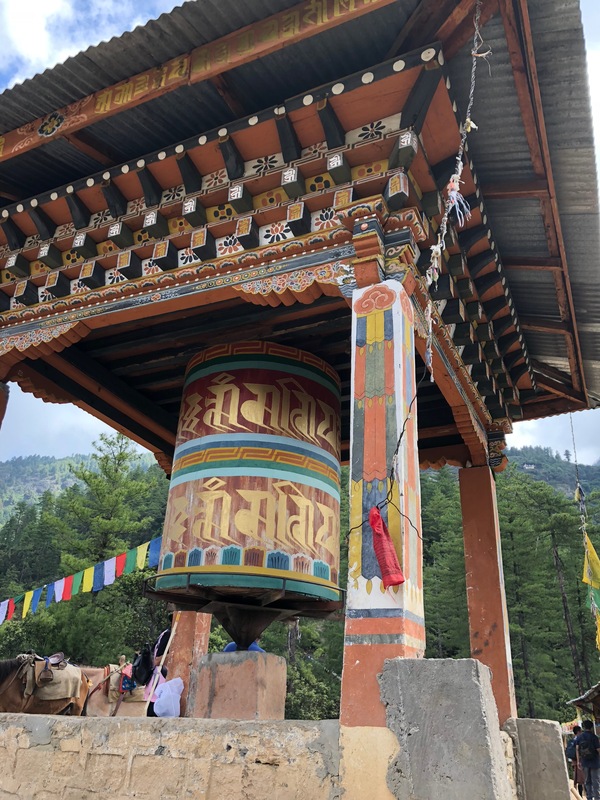 The more I read about it, the more I knew that it was something I needed to add to my Bhutan itinerary. I was, however, apprehensive. I’m not an outdoors person. I’m definitely not a hiker. I am affected by even the slightest altitude change. 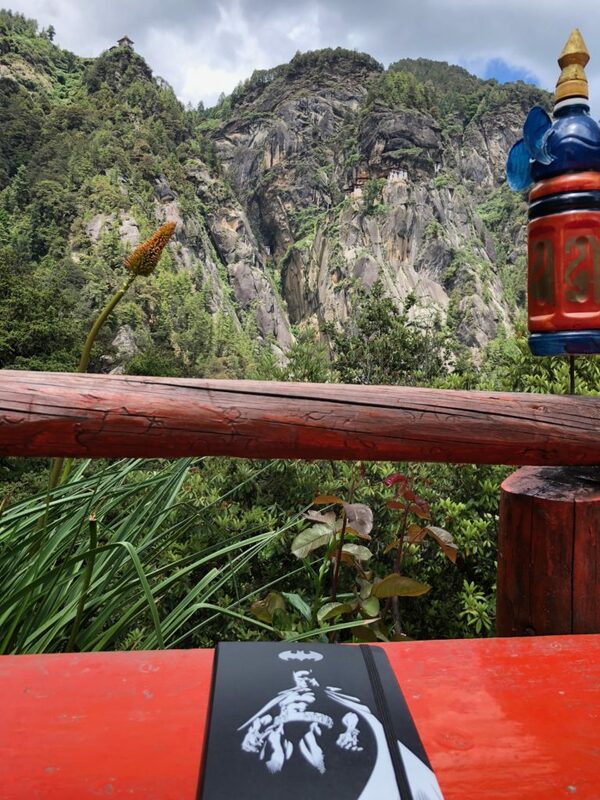 It really helped me to read people’s experiences hiking up to Tiger’s Nest. My takeaway from the various posts: (1) If you are generally physically fit, you can do the hike (2) Do not rush; take your time (3) The final destination makes it totally worth it. 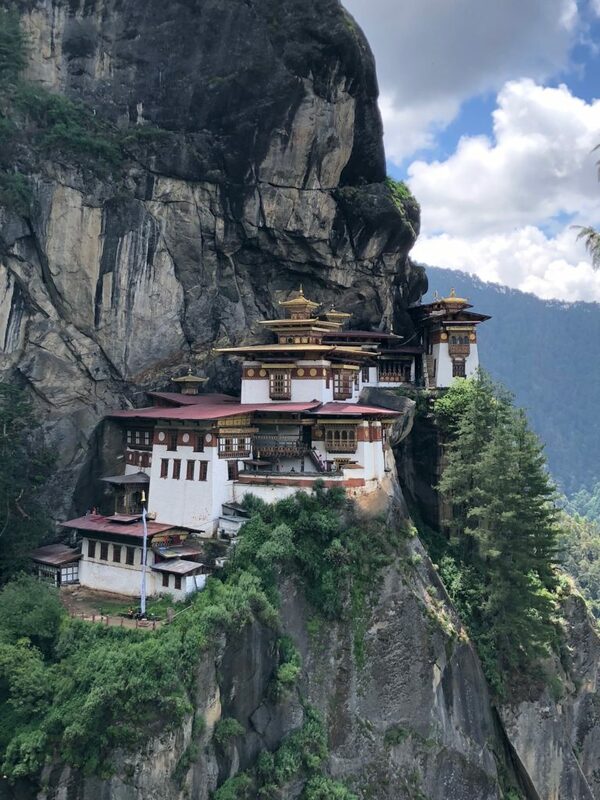 Paro Taktsang, commonly called Tiger’s Nest, is a monastery composed of several temples nestled on a cliff 3,120 meters (10,240 ft) in the Himalayan mountains. It was first built in 1692. The legend is that Padmasambhava, also known as Guru Rinpoche, arrived at the temple site on the back of a flying tigress. 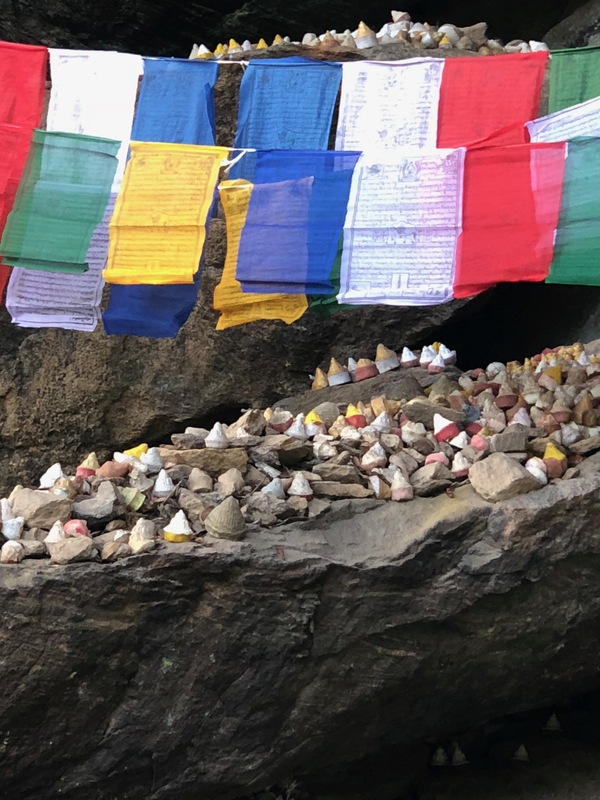 At this site was a cave in which he meditated for at least three years, three months, three weeks, three days, and three hours. After this time, he emerged from the cave and subdued the demons residing in the valley below. From this point, he started introducing Buddhism to Bhutan. The temples were built some nine centuries later (1600s) and have been replaced several times due to destruction by fire. 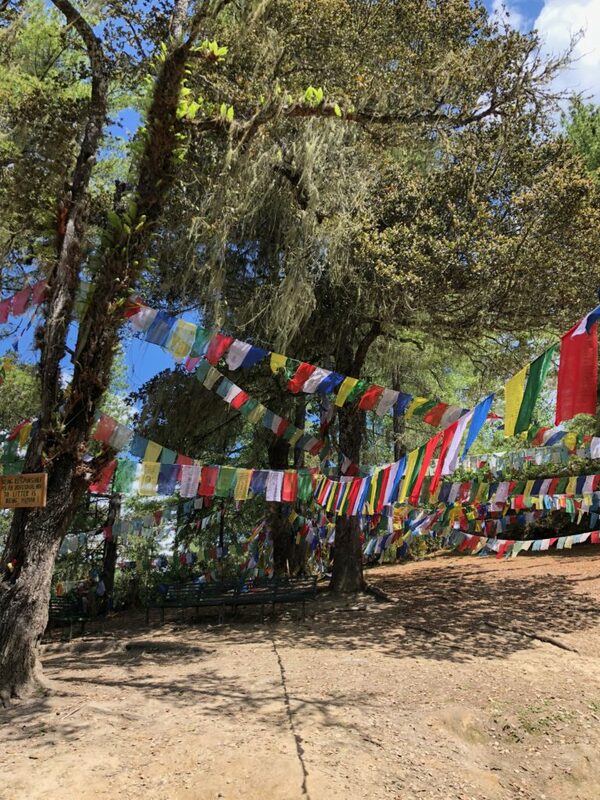 While the idea of such a sacred site being burnt down sounds awful, the idea of impermanence which resonates throughout Buddhism is symbolic here. Time and time again during my travels through Bhutan I was told about detachment and the cycle of life. It is attachment to things that causes suffering and difficulties. 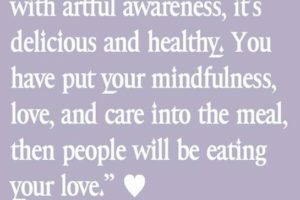 Once you embrace the impermanence of life (and of things) then you get closer to nirvana. I was in bed by 10:30 p.m. the night before my hike. It took me a bit longer to fall asleep as I was nervous and excited about my upcoming adventure. I set several alarms. I wanted to get ready and head down for breakfast as soon as the restaurant opened (6:30 a.m.) so that I could relax while eating and still finish in time for me to digest my food and get ready to hit the road by 8 a.m.
Unsure of what to eat, I did a quick search online of what people ate before hikes at altitude. Carbs. Fruit. Nut butter. Something sweet. I got the breakfast buffet at exactly 6:30. I was the only one there. The smells of all the yummy baked goods were so enticing. However, I stuck to 2 slices of toast. I had peanut butter with a bit of honey on one slice and Nutella (something I never eat) on the other. I had ¼ a cup of coffee (I don’t normally drink coffee, but I found that a bit of caffeine helps with the dizziness I feel from the altitude). I also had about a cup of papaya. I drank about ½ litre of water before heading out – I normally would have had more, but my fear of public bathrooms kept me from drinking anymore. My driver was ready and waiting and we departed the hotel at exactly 8 a.m. It took about 35 minutes to get to the Tiger’s Nest base camp. The sky was slightly overcast. I had thought that I would be chilly because of that … but that definitely wasn’t the case! Since my guide’s house is actually just beside the base camp, we picked him up as we just as we approached the start point. 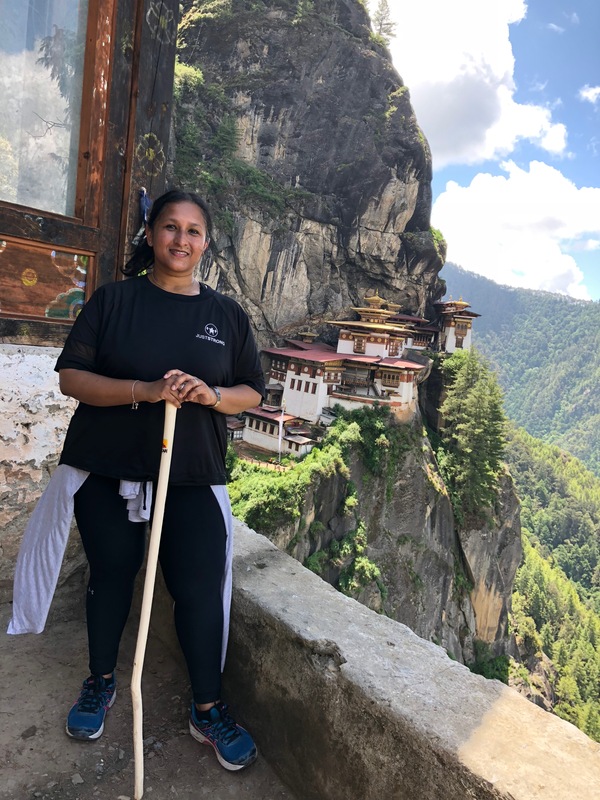 I paid the 500 Ng (around US$7) for the ticket to the monastery and paid another 50 Ng (less than US$1) for a wooden walking stick (which I found incredibly helpful). We started at 8:50 a.m. My guide (Karma) insisted on carrying my backpack even though I assured him I could carry it on my own. Stalls were being set up to sell handicrafts and local goods on either side of a pathway that led to the start of the trail. A few meters ahead I saw the horses that people could rent to take them up to the halfway point (the cafeteria) of the hike. The uphill (up-mountain?) climb started pretty much immediately and I also felt out of breath almost as soon as I started. 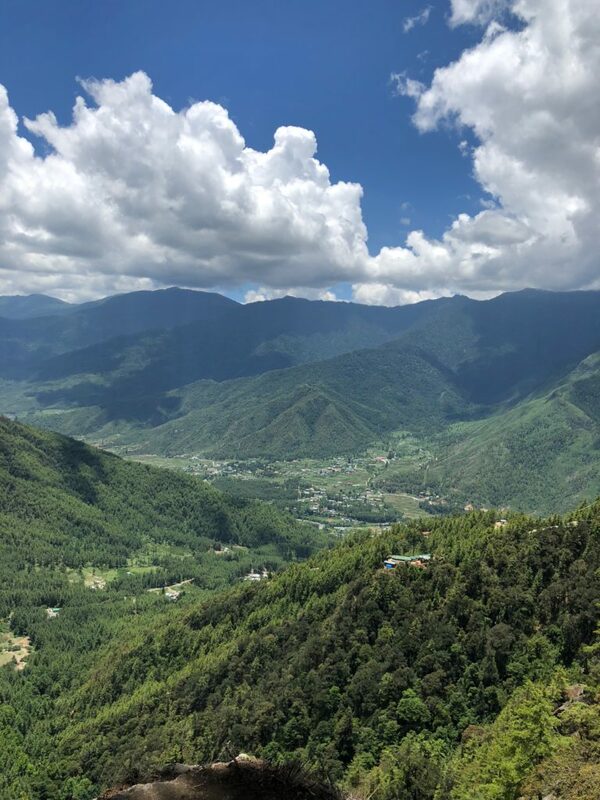 Even though I knew the altitude affected me (I even felt slightly breathless in Thimphu and Paro when not doing anything at all), it still caught me off guard a bit. I got worried that I wouldn’t be able to do it. If this is how I was feeling 5 minutes into the hike, how would I make it the whole way and back? My guide told me that it would probably take just over 3 hours to hike up and about 2 hours to hike down, so in my mind I gave myself 3-4 hours to hike up and 2-3 hours to descend. Give me a flat surface and those time estimates are no problem … but would I really be able to do this for 3 hours?! I had to shake off these worries and fears. I was here not just to visit the glorious monastery and for the hike; I was here to prove to myself I could do it. This was the time for me to test whether I could really push through my worries and doubts and actually do this. 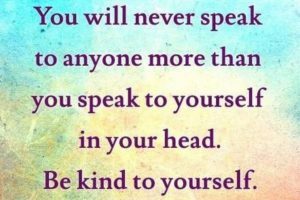 So after a bit of self-scolding (stop doubting yourself!) and a bit of self-encouragement (you know you can do this, just put one foot in front of the other and take your time), I kept climbing. I’ll be honest, I found it tough. I felt like I was moving at a snail’s pace. I wanted to stop every 5-10 steps to catch my breath. I kept trying to practice my nasal breathing that I learned in pranayama class to help me catch my breath, but after a few nasal breaths I found my mouth open again trying to gulp in as much air as possible. I told myself to walk 20 steps and then stop if needed … and if there was a shaded patch just beyond those 20 steps, then that was my target. 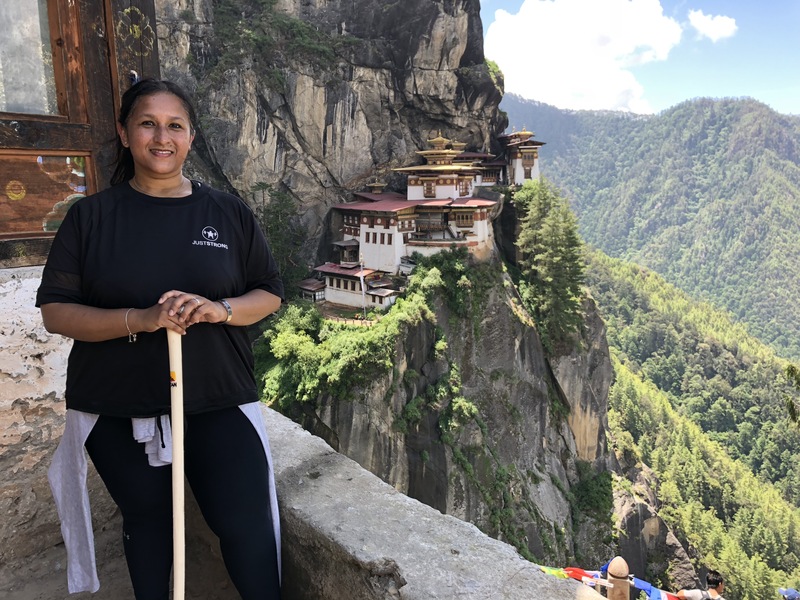 I concentrated on my footing (worried that I might trip and fall or step on some horse poo – or worse, stumble and fall into some horse poo), but I also made sure to take time not just to rest, but to admire the scenery – as it truly was breathtaking. I took some photos, but honestly, none of my photos do the actual surroundings any bit of justice. It was spectacular. The sky was clear. The trees were lush. The mountains impressive. I continued the up-mountain climb. The path wasn’t too wide and it was a mixture of sandy slopes, roots of trees, and wooden branches that sometimes formed steps. It was all uphill save for a couple of seconds here and there where it was either somewhat flat or a slight dip in the path. Even those few seconds felt like a relief on my legs. I got to the cafeteria around 10:15 a.m. (the halfway point). Tea and coffee along with some biscuits were being served. Although there was a nice view of the monastery from the café, I chose not to stop. It was a bit crowded (as many people had come up here by horseback) and I felt that if I stopped for too long here then it would be hard for me to continue the climb. After all, I was only halfway there! I’m glad I continued as there were hardly any people along the path. I enjoyed the silence. The hike, though continuing to be challenging, felt meditative as well. After all, it really is a pilgrimage. My guide had his prayer beads out and was reciting his mantras. I found the faint hum of his prayer to be the perfect accompaniment to the hike. As I got closer and closer to the top, I was getting better views of the monastery. That definitely helped me keep moving forward, particularly because just as you get to the parallel point (with the best view of the monastery), is when you realize that you still have 600+ steps to climb down along with 200+ steps to climb up before you get there. Dig deep. Concentrate on your footing. Take your time. The best thing about the climb down was the bit of relief I felt from the altitude. It wasn’t much, but it was something. After the climb down, which is also tough to navigate if you have people coming up at the same time since the stairs are narrow, there’s a small waterfall which a is a lovely site and sound. It gives you that last energy boost you need to climb up the final 200 steps. I made it to the Tiger’s Nest by 11:05 a.m. Both my guide and I were shocked that it only took 2 hrs. and 15 minutes to do the climb, particularly when we thought it would have taken at least 3 hours … and also because I literally stopped every 20 steps to catch my breath. Once you get up those steps you have to put all your belongings in a locker. I gave it to my guide to store. You have to leave your walking stick behind. Just when you think you may be done with stairs for a while and finally ready to enjoy the peaceful scenery … you’re wrong. More high stone steps that take you up to the monastery and then into the monastery. The monastery itself is comprised of several smaller temples. The first one I went into was small. Sitting in the crevice of the window was a monk chanting from a book. I wanted to just sit there and meditate. At that point I was so glad that we were not allowed to bring cameras because I know I would have been tempted to take photo after photo and video after video instead of be fully present in the moment. In each temple we went to my guide told me a story or anecdote that went along with the structure, what happened in the room, and a bit more history of both the temple and Buddhism in general. In another temple there were 20+ monks who were chanting. It was hypnotic. I stayed in that temple for around 10 minutes. As much as I was intrigued and enchanted with my surroundings, I did feel like I was intruding. After all, this was their place of worship and prayer. I understand that the money raised from the tickets and the donations given help sustain the place as well as the monks who live there. Nevertheless, I am so pleased that they opened up their doors to allow others to have a glimpse of what it’s like inside and to take part in this incredible experience. I was in the monastery for about 45 minutes. Then it was time for the descent. Going down 200 steps wasn’t a problem, you just had to be considerate of those who were coming up. 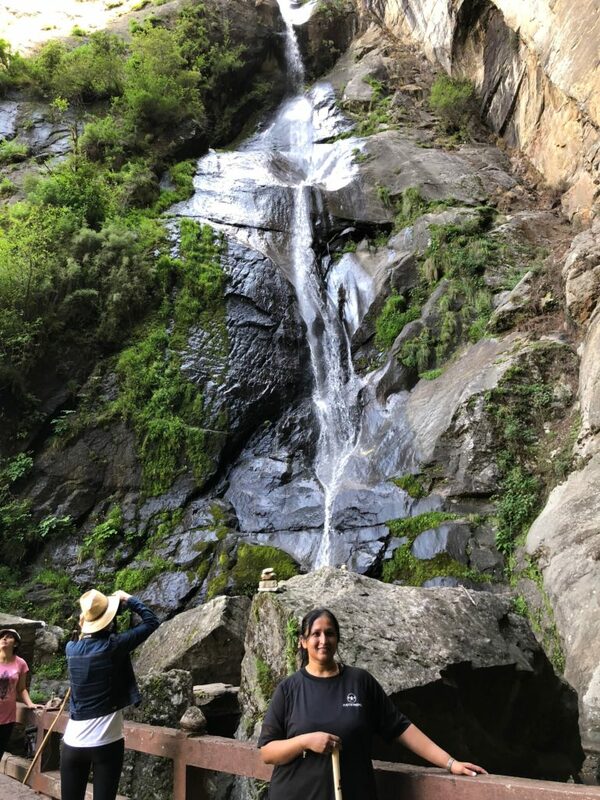 You cross the small waterfall again and then … you know it’s time to climb back up those 600+ steps. That part actually wasn’t as bad as I thought it was going to be. Once again counting helped me. I would go up 50 steps and then take a 30 second – 1 minute break and then continue. There’s not much space to rest so that definitely compels you to keep moving, that as well as the people who are coming up behind you. 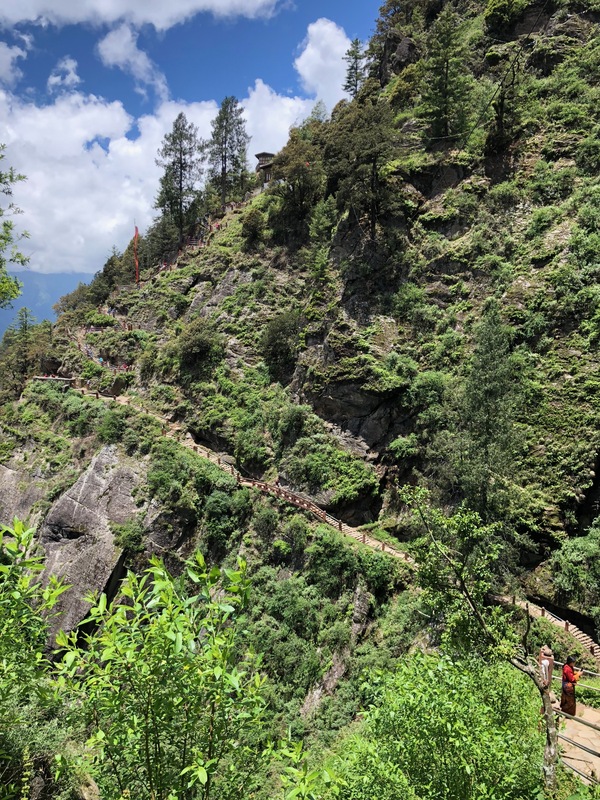 The fact that you’ll be going downhill from then on and that this is the last uphill part of the trek is also encouraging! I thought the downhill part would be a breeze – but it actually wasn’t that easy. I didn’t consider the steepness of the mountain. There was loose sand in many places and I did end up slipping twice. I didn’t fall hard, and actually because of the steepness I just kind of sat back as I felt myself lose my footing. I also felt a lot of pressure and strain on my legs, knees, and toes. Again, I took my time going down and paid close attention to my footing. On the way down I stopped at the café. Inside they were serving a full buffet lunch. Although it was hot, I decided to sit outside and stare at the mountains and the monastery. It was also quieter outside. This was the perfect time and place to do a bit of journaling and just let myself be engulfed in the surrounding beauty. I missed my brother. I wanted to scream his name aloud and hear it echoing off the mountains. I wanted to share this moment with him, and although I know he is always in my heart, I felt his absence so much in that moment. It’s hard to have new adventures and not get to share them with him. As much as I was focusing on the moment, it also felt like something was missing. It’s strange how that strong absence also felt like a strong presence. After lingering at the café for about 30 minutes, I continued my descent. It took me about 1 ½ hours in total to go down. 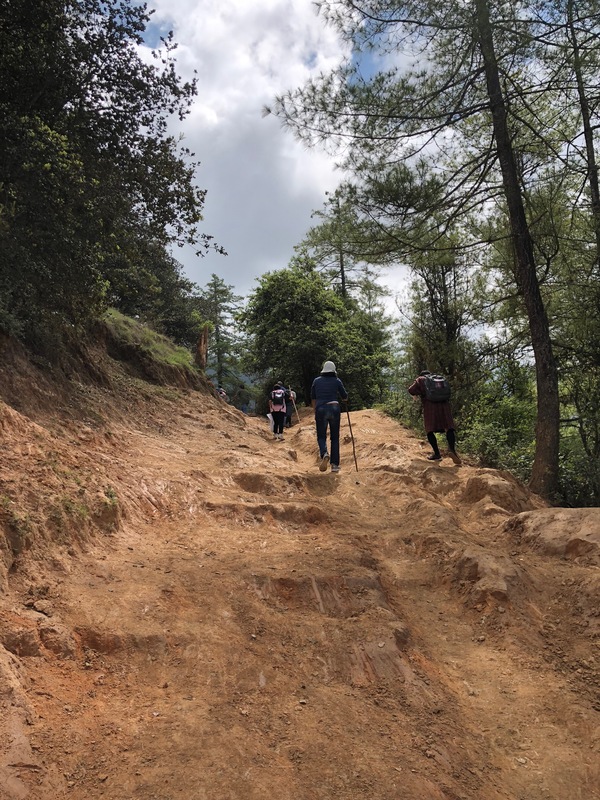 I crossed paths with several people who were starting their climb – they all wearily asked how much further they had to go and if it was worth it. I couldn’t imagine doing the climb in such heat (as this was around 12:30/1 p.m.). I told them to take their time but they still had over halfway to go. I encouraged them to at least make it to the parallel point so that they could enjoy the spectacular view. As I got closer and closer to the base camp, I couldn’t help but smile – I did it. I actually did it. 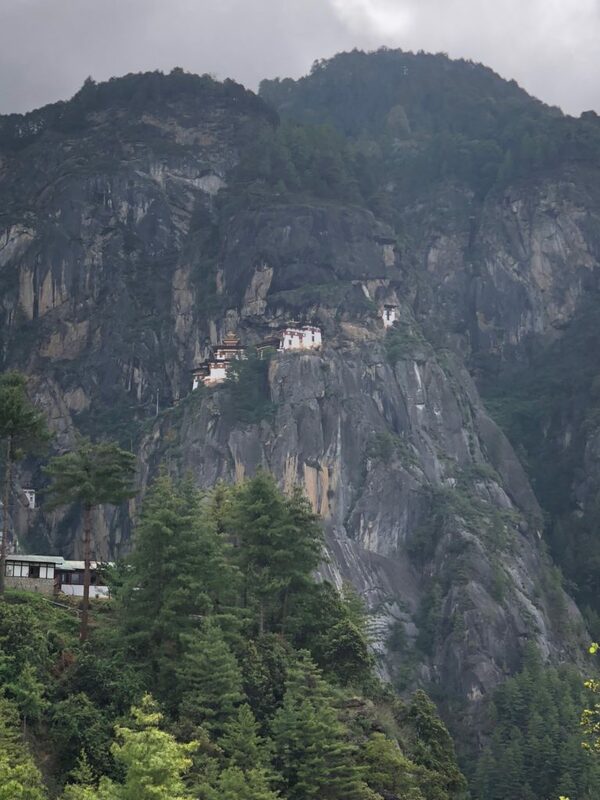 Looking back up and seeing the Tiger’s Nest Monastery perched precariously at the edge of a cliff of one of the Himalayan mountains I had to shake my head in disbelief … I did it. The biggest treat for me was seeing my parents standing at the end of the pathway. I felt like I was coming home after a long trip away. They were so excited for me (and relieved that I came back safely). It was a great moment. Many people did the climb with a couple of friends or in a small group. While I think it can help motivate you to keep climbing, I’m glad I did this on my own. With the difficult year I’ve had, I felt like I needed to achieve something for myself, to prove to myself that I still have determination inside me, I still have some fight. 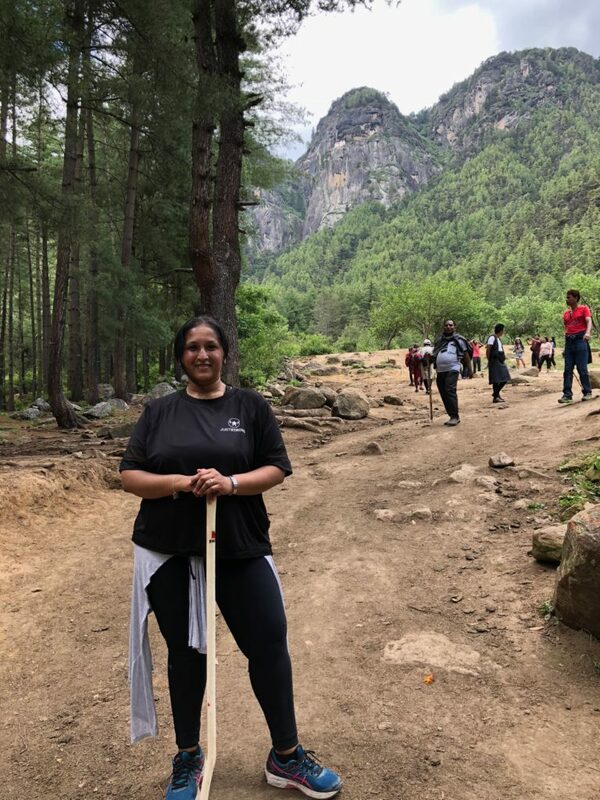 I also learned something else about myself – and maybe this isn’t the most encouraging thing to hear, but this is my personal experience – I learned that hiking isn’t actually that exciting for me. I’m glad that I did this, but I didn’t finish this hike with an eagerness to find out where in the world I should travel to do another adventurous hike. I think if I traveled somewhere and they had something like this, I would definitely do it, but to actively seek out a hiking adventure – no, that’s not for me. That altitude really left me feeling weak and drained and I didn’t enjoy that feeling at all. The sense of accomplishment at the end of the whole thing was incredible, and I really am amazed at myself for doing it. This is a memory I will hold on to for a long time to come. I had originally planned to wear my cargo pants and a t-shirt along with my Asics trainers. However, by the end of this trip, the trousers were a bit loose so I didn’t want to be fidgeting with my clothes. I ended up wearing one of my gym outfits for the climb (Under Armor leggings, a dry fit long tank top, an Under Armor t-shirt, and my oversized Just Strong moisture-wicking top. I had a light cardigan tied at my waist. I’m glad I brought it because you had to have your arms (and legs) covered to enter the temple). I carried a baseball cap with me, but I didn’t wear it. After seeing how red my face got from the climb, I realize I should have. I wore my regular gym trainers and socks. I realized that the most important thing for the climb is to be comfortable. I had no special hiking gear at all, aside from the $1 stick I bought at base camp, which – as I’ve said before – was really helpful. Don’t wear black – it got really hot! I should have worn lighter colored clothing and carried layers just in case. Start as early as you can; if I ever did this again, I’d start at around 6 a.m. and take my time getting to the top. The monastery is open from 9-5 (might close at 4 in the winter) though closes from 1-2 for lunch. Take your time – you’re not in a race with anyone and the effects of altitude sickness should not be taken lightly. Walk at your own pace; rest when you need to and sip water throughout the trek. Pay attention to where you’re walking. It’s easy to get mesmerized by the surrounding scenery. However, if you don’t watch where you’re going, you could stumble and fall. Walk. Pause and stand to one side (to allow others to pass) and enjoy the scenery. Then walk again. Make sure you’re standing on solid ground/a safe place when taking a photograph; the ground is not even. The last thing you want is to be walking backwards while looking through a camera to capture the perfect shot … and you end up falling. Be careful. Be respectful towards other hikers. If you’re going to stop, make sure you stand to the side or at least let those who are walking pass by. If you are walking, look out for those who have stopped. Also remember that this is a pilgrimage for many. The worst part about this hike for me was the other tourists. There were several loud, boisterous groups who were literally screaming and shouting at each other and shrieking with laughter in a way that was very disruptive and, in my opinion, disrespectful. There were also others who had music playing off the speaker of their phone as they were climbing. If you want to listen to music, put headphones on. 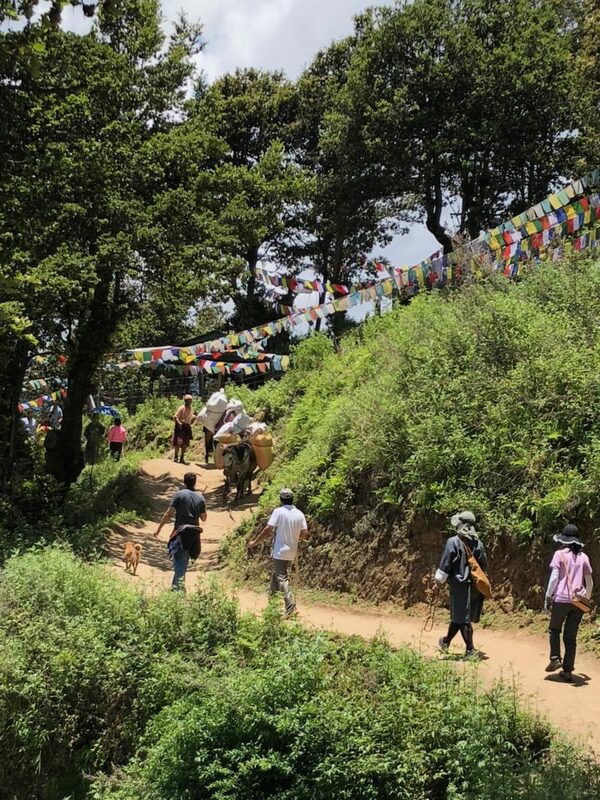 Do the trip towards the end of your visit to Bhutan as your previous days will have helped you get used to some of the altitude. Take lots of photos but be sure to take some time to really enjoy the view and the surroundings. It really is magical.